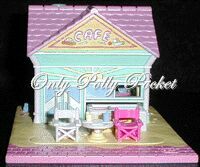 The Beach Cafe is a great place to go on hot summer days, and Polly and Little Lulu Love to sit at the table outside in the sun to have their lemonade. 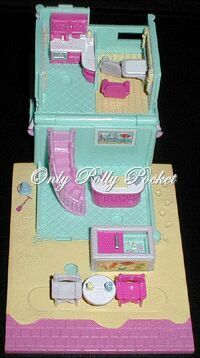 Inside, there's a cool ice-cream parlour and soda fountain where they can sit down with their friends to enjoy a sundae, or they can buy a lolly from the big freezer outside to take away. Afterwards, they play on the beach with Little Lulu's ball."